This plastic male urinal with lid is designed to help prevent spills. 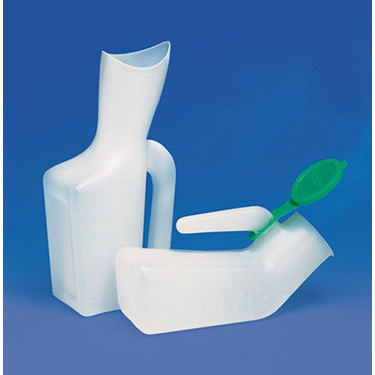 This plastic urinal has a sturdy grip for easy handling and can be used in several positions by a bedridden patient. Lightweight, durable and easy to clean. Holds 1000 cc\'s with graduation marks to measure output. Convenient wide opening for night time use. Pros:Comes with a cap if you do not feel like emptying right away. Cons:Markings on bottle for measurements could be improved. Very helpful. My Dad feels better knowing it's there when he needs it. Pros:Convenient and easy to use. too wide at the mouth, not enough curve at opening, poor design overall. Difficult to use. Adequate for what is needed.